Filters help you to see only movies of a special kind in your movie list. Many more dynamic filters were included such as the "Not Watched For..."-filter ("What movie haven't I seen in a long time?" or "Which movies haven't I seen yet?"). These and many more filters can be found right next to the movie list. It's up to you which columns you want and where you want them to be displayed. If you're still looking for the most simplest list view, just hide the Cover, Actors and Director columns and you'll have the simple list view known from MBase 1. 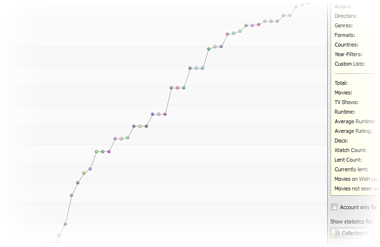 Additionally, indicators can quickly tell you which movies are lent or haven't been watched yet. Don't you sometimes wonder how old the actor was in that movie you just saw? Well, now you'll always know. The Details are skinnable and they're also interactive. 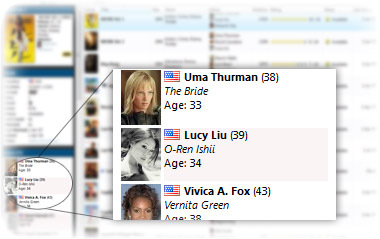 So clicking on the actor will show you the actor's details and a list of the movies you have where he starred in. With the help of the new Loan Management you'll now always know how some of your movies went missing. The built-in friend system allows you to have reminders sent to your friends when they're overdue with your movies. Of course MBase will remind you when one of your friends forgot to bring you your movie back and also provide you a detailed overview of who lent what and when with a complete history for each movie and friend. 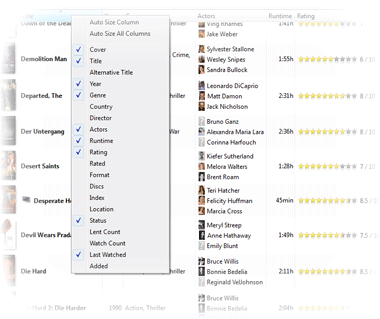 The built-in Search can be found right at your fingertips above the movie list. The Search doesn't limit you in any way, so you can search for anything - "Bruce Willis", "Luke Skywalker", "Japan", "Comedy", "Lent", ... Combined with wildcards (*, ?) the Search can be an even more powerful function than the Filters. 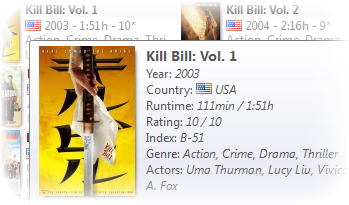 Wikipedia might offer some interesting facts about your selected movie or actor, so why not have it displayed right where it can easily be reached? You don't always have to go into detail. 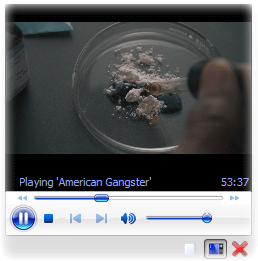 Why not have MBase show you a little info box when you move your mouse pointer on a movie? Oh yeah - did we mention that MBase has alternative views for your movies? 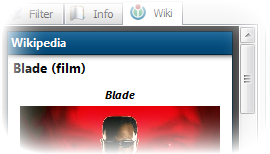 If you have linked your movie entry with the actual file on the disk or added it via Drag & Drop, you'll be able to play the movie right in MBase. The built-in player can be undocked and moved around your screen. Or let MBase start the movie in your default player, whatever you prefer.